Neuro-Optometric Rehabilitation is the examination and rehabilitative treatment of adult and pediatric patients with eye/vision dysfunction related to neurological conditions like traumatic brain injury, brain tumor, stroke, cerebral palsy, and multiple sclerosis. Neuro-visual problems can manifest as reading difficulties, visual inattention, eyestrain, double vision, visual memory problems, visually related anxiety, balance and postural difficulties, side vision loss, sensitivity to bright light, and other related symptoms or signs. All can be treated with Neuro-Optometric Rehabilitation. Dr. Azman is one of the few eye doctors in the U.S.A. who is involved in Neuro-Optometric Rehabilitation. 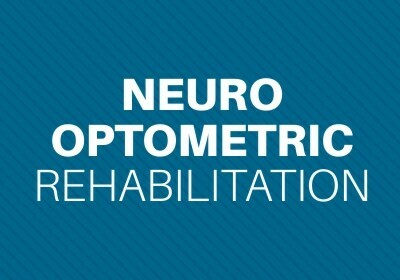 What Does Neuro-Optometric Rehabilitation Treat? Neuro-Optometric Rehabilitation treats double vision, eye muscle problems, side vision loss, focusing problems, and eye tracking difficulties. Other conditions treated include visual perception difficulties, visual-motor deficits, eye-hand coordination problems, light sensitivity, visually related postural or balance problems, and visual acuity impairment. What Is Post-Trauma Vision Syndrome? Post-Trauma Vision Syndrome (PTVS) is a disruption of the visual fibers of the brain caused by brain injury. Neuro-Optometric treatment of PTVS includes special treatment lenses, prisms, selective occlusion, neuro-optometric rehabilitative vision therapy, and other medically necessary visual treatment modalities and strategies. The treatment goal is to enhance and/or rehabilitate disrupted visual function. Patients who have had a stroke or traumatic brain injury may lose one half of their peripheral vision, usually to the left. This type of side vision loss is called hemianopsia. Many patients who have hemianopsia are aware of the side vision loss. Some patients, however, are not aware of the side vision loss. That’s called neglect. When a patient has hemianopsia and/or neglect, treatments are prescribed to make the patient more visually aware in the area toward their side vision loss. What Are Side Vision Awareness Glasses? Dr. Azman has successfully treated hundreds of patients with hemianopsia and neglect. Side Vision Awareness Glasses are designed and prescribed by Dr. Azman. These custom-made glasses allow an immediate increase of about 15°- 20° in side vision awareness. This helps reduce hemianopsia-related safety issues, and enhances the patient’s sense of independence and performance of many activities of daily living. Like hearing aids, side vision awareness glasses are an out of pocket expense. A worthwhile price to pay for better side vision and more independence.